Falling Through the Cracks, or Straying Sheep? What if, instead of “falling through the cracks,” we use a different image: “straying from the flock.” That picture seems more fitting for at least two reasons. First, “straying” implies that a disconnected church member bears a personal responsibility to stay involved with the congregation. Sheep don’t ordinarily leave a flock by inadvertently plummeting into a void. They wander away over time through a series of choices. Second, the image of straying sheep also suggests that someone should keep watch over the flock and take action when a sheep begins to meander away. Yes, each member has a personal responsibility not to roam, but all church members have a duty to watch out for one another. However, one group in particular has an obligation to be on the lookout for straying sheep: the elders. Jesus, in contrast, is the “good shepherd” who leaves the 99 to pursue the one wayward sheep, something which is indeed “reckless” from a business perspective (and this is exactly what the lyrics of Cory Ashbury’s song “Reckless Love” come from). The difficult balance from a church leader’s perspective is how to be a good shepherd under Jesus, and being overbearing. May God give us wisdom and grace as we seek to do His work! Starting today, every Wednesday we will be dropping a new episode, in which we will be covering some of the topics addressed here on the blog, as well as others topics and interviews with guests about topics relevant to life, culture and the gospel. Check out Episode 1: The Role of the Law in the Life of the Believer, and follow us on YouTube or Vimeo and Soundcloud. You can help us spread the word by giving the video a like and sharing it on your social media or sending it directly to some friends. Thanks to Ocean Babin for all his hard work recording and editing this video, as well as to CryBaby Design for the great background image. We also want to thank Nick Morris Sound Services for making the music for the intro! How Much Time Should a Pastor Spend Preparing a Sermon? I like to joke that as a pastor I only work one day a week, but the truth is that on average most pastors work 50-60 hours a week. This time is spent managing, planning, corresponding – and of course: studying and preparing a sermon. Sermon preparation can take a lot of time, especially for a perfectionist. I know that I have often certainly spent an inordinate amount of time preparing my sermons before; partly because I consider it a high and holy calling to preach and teach the Word of God, and also because it is something I enjoy doing and I want to do it well, in a way that truly honors God and impacts peoples’ lives. So how much time should a preacher spend on preparing a sermon? I heard one well-known pastor say once at a conference that he only spent about four hours per week preparing his message. He then added that this is because he has a team of people who do all of his research for him, and he takes the material they bring him and organizes it into a message. Most pastors don’t have this luxury, nor would they want someone else doing their studying for them. A friend of mine who pastors a small church told me that he spends 30 hours per week preparing for his Sunday message. He also has a midweek service, for which he prepares about 15 hours. The result of that is that he doesn’t have time for anything else except sermon preparation. In other words: he doesn’t have any time left over to be a pastor (Greek for “shepherd”) to his congregation. He is only a preacher. Particularly in smaller congregations, it is important that a pastor not only be a preacher, but a shepherd, and he and I both agreed that his time allocation in this area was more of a detriment than a blessing to his congregation. As for myself, in addition to my regular duties as a pastor, I have a wife and young children who I like spending time with, and in the past few months I have taken on hosting a live radio show once a week and I’m studying for my Masters, which requires about 16 hours of my attention every week. All this means that I need to be good at managing my time well, not only for my own benefit, but for the benefit of my family and my church. 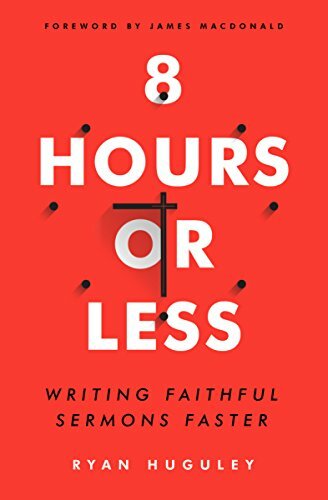 So I was intrigued a few weeks ago when a friend recommended this book: 8 Hours or Less: Writing Faithful Sermons Faster by Ryan Huguley. It sounded a bit gimmicky to me at first, but after reading it, I think it’s a great resource that I would recommend. Basically, in the book, he outlines a plan for your week, which has you doing certain tasks each day for an hour or two, which help you focus and write better sermons faster. I think that’s really key; it’s not hard to write sermons faster – the question is if they will be good sermons. The system he lays out is intended not only to improve the speed, but also the quality of sermons. One part which was foreign to me is that on Tuesdays he has you study the text and review your outline with a small group of people. This is probably the part I was most hesitant about, but the part which I have enjoyed the most. If the end result is better sermons and more time for a pastor to spend pastoring people, leading the church and preparing for the future, and having more time for their families, that’s a win-win-win. I recommend this book whole-heartedly. What Makes Someone a Missionary? I spent 10 years in Hungary as a missionary. I had a visa and several legal papers for my residence there which stated on them that I was a missionary. Furthermore, I was sent out and supported by a number of churches who supported as a missionary. This having been the case, I have put a lot of thought over the years into what it is that makes someone a “missionary”. I remember working alongside Hungarians in Hungary, doing the same work – and yet I carried the title of missionary, and they were just Christians who were serving the Lord. Every now and then, some of them would say that they too were missionaries then, since they were doing the same work. But what about the other Christians in Hungary who were not with our organization, who did similar work? Were they also missionaries? They didn’t seem to covet that title, but were content to consider their service simply completely normal Christian behavior. Some Hungarians we worked with received financial support from churches in the West so that they could serve full time at a church. Did that make them missionaries, even though they were serving in their home country or culture? Some missions organizations use the term “native missionaries” and raise funds in wealthier countries to support national workers who already know the culture and language of a place. The idea is that with the proper training and some financial support to free them up to do the work, these local Christian workers will be able to reach the places where they live more effectively than foreign missionaries. This is especially popular in countries which do not give visas to foreign missionaries. Is the word “missionary” appropriate in this case? One time when my wife and I had come back from Hungary to visit family and supporters, we were in Carlsbad, CA, and at the beach some young people, probably in their early 20’s, approached us and started talking about Jesus. They were evangelizing – and when we told them we were Christians, they told us that they had come from somewhere in the Midwest as missionaries to California. They hadn’t been sent by any church community, but believed they were called and so they had come. Does that make you a missionary? When I moved to Longmont I knew some people who said that they were missionaries to Longmont, and raised support for their living expenses and various ministry endeavors, so that they could be free to pursue these things full-time. These particular people had grown up in Longmont and felt called to serve God in their hometown. So what are we to make of all of this? What makes someone a missionary? Missio = send. Thus, to be a missionary is to be someone who is sent. There is a sense in which all Christians have been sent by Jesus to carry out his mission, which he received from the Father, in his mission field, which is the entire world. However, some are sent and supported by a local body of believers, led by a sense of calling from God, like Paul and Barnabas in Acts ch 13. It is clear from the Book of Acts, that Paul had an ongoing relationship with his “sending church” in Antioch, returning there after each of his missionary journeys. It seems there there was an accountability, and probably some degree of financial support from the church there which had sent Paul out. Here’s how I sort it out: All Christians are called by be “on mission” with God, in his mission field, which is the entire world. In fact, to be on mission is an essential and inherent part of what it means to be a Christian. Therefore, it should be normal for all Christians to do the work of a missionary wherever they live, whether it is their home or not. This is the NORMAL Christian life. And yet, I feel that we should preserve the significance of the word “missionary” for those who are sent out on a mission by a local body of believers to another place, following the leading of God. There is a way in which to use the word missionary to loosely diminishes the sacrifices and the unique challenges faced by those who leave home and country and follow God’s leading to go to another place, having had a local body of believers confirm this by sending them out. Similarly, there is a way in which the concept of the priesthood of all believers can be taken to a degree which detracts from the significance of a calling to be a pastoral overseer. While we are all called to minister and we are all called to be on mission, these titles point to particular roles. There is an interesting place in Paul’s second letter to Timothy, where Paul tells Timothy: “Do the work of an evangelist.” (2 Timothy 4:5) Paul, in Ephesians 4, mentions the “office” or official role in the church of “evangelist” – in other words, it seems that there were some people in the church who had this title. However, it would seem that even though this was not Timothy’s official title or role, Paul was encouraging him to do the work of an evangelist nonetheless. I believe the same applies in regard to the discussion of the term “missionary” or “pastor”. If you are a Christian, you may not be an officially sanctioned “missionary” – but you are called to do the work of a missionary nevertheless! You may not be a pastor, but you are still called to do the work of a pastor in your interactions with other people. On Saturday night I was struck with a feeling that I have from time to time: that my sermon for Sunday was not good. I was convinced it was one of my worst sermons ever. As I looked it over I thought: My exegesis and hermeneutics are good, I’m presenting the Gospel and talking about how the Gospel speaks to all of life… The essential elements were in place, so what was I worried about? Maybe I was just tired from the long drive back from California, maybe I was just feeling that the final draft wasn’t like the way I originally envisioned the message. But I went to church on Sunday morning asking God more than usual to speak through me, even through this message. This isn’t the first time I’ve felt this way. But here’s the irony: it seems that every time I feel this way, convinced that my sermon – although it has all the right elements – is not my best, God seems to use it in an extra special way. This Sunday, through this message, I had more than one person respond to my invitation to give their life to Jesus and make a decision for him. Another person told my wife that it was the best sermon I had ever preached. I got several emails and text messages after church about the message from people saying they were encouraged and blessed by it. Here’s the audio of that message. On a previous occasion, where I specifically remember telling my wife that my sermon was going to be my worst ever, I preached a message which again someone afterwards told me was my best ever, and now has also become one of my favorite sermons as well. When it recently aired on our radio program on GraceFM, we had several people contact our church asking for copies of it. A newer member of our church ran across that message a week or so ago and shared it on Facebook, and then wrote me that if I preached that message every Sunday, he would come – it was the best sermon he’d ever heard in his life. Here’s the audio of that message. I heard Timothy Keller say once in a lecture to pastors about preaching, that we should always seek to prepare “Good Sermons” – meaning that we should make sure all the essential elements are in there: good exegesis and hermeneutics, good presentation of the Gospel and of Jesus as the answer to all the riddles, that they are “Good”. Our job is to prepare “Good Sermons” – because only God can make a sermon “Great” – and that happens, when the Holy Spirit takes our “Good Sermons” and makes them “Great” in the hearts and minds of our hearers. If we try to make “Great Sermons” we will be trying too hard to do something that only God can do. When I heard him say that, I agreed in theory that he was right, but more and more I am experiencing the reality myself. God likes to glorify Himself, and it’s less about me that I am inclined to think. Praise God for that. I just spent the past week at the Calvary Chapel Pastor’s Conference in Costa Mesa, CA. Even though the church I lead is called White Fields, I was ordained in Calvary Chapel and have many good relationships there, and very much respect for the core values and aspirations of the movement. One of the best things about these conferences is the fellowship with other pastors – having so many people together who are doing the same work, facing the same issues and working for the same things for the same reasons is rare, and very refreshing. I remember one leader I worked with who used to discribe these kinds of meetings as being like Gilgal: the place in the book of Joshua that was the home base of the people of Israel during the time they were moving out to take conquest of the land which God had promised to give them, but which they had to go out and take by faith, but with much work. This leader would say: This is our Gilgal. We go out into the fight, steping out in faith, obeying God, fighting to take hold of territory – and we come back here, after our defeats, after our victories, to worship, to encourage each other, to share stories from the field of what we experienced: to celebrate victories, to lick each others wounds – and then we go out again. I’ve always considered that a great analogy of these kinds of gatherings, and that is certainly what this conference was like for me. I’m feeling blessed and refreshed and excited to get back to the work that God has called me to in Colorado. It’s time to get up honey, you need to get ready for church! You’re going to be late! I don’t want to go to church today! It’s boring and the people there are all jerks and nobody is nice to me. But honey, you have to go to church! You’re the pastor! Now, just to be clear: I LOVE going to church! And not just because I’m the pastor. But I do know that some people sometimes struggle for various reasons with not feeling like they want to go to church. I would encourage you with the words of Paul’s letter to the Galatians: That going to church, being in fellowship, joining in prayer, singing songs of praise and worship to God, partaking in Communion, hearing the Scriptures read aloud and expounded upon, hearing the Gospel message proclaimed and applied to real-life scenarios – these things are tantamount to “sowing to the Spirit”. When you don’t feel like going to church, I encourage you to make the choice to sow to the Spirit – take that hour and a half out of your Sunday morning to sow to the Spirit and you will, in due season, reap a harvest of joy and life and righteousness.